By the way, conventional warfare appear more dangerous because the cyber warfare is young, not yet fully exploited and easily hidden from the public. By conventional thinking we may point out the “subject-verb agreement” error in “conventional warfare appear more dangerous”. However Columbia School linguistics not only considers the number on the noun but also the number on the verb. Say what? The following borrows heavily from a part of a 2011 paper titled The communicative function of English verb number by Wallis Reid. Noun number is widely known e.g. take the noun ‘CatØ’ here there is ONE entity in focus (indicated by the zero signal Ø) add a suffix -S and there is MORE THAN ONE entity in focus – ‘CatS’. Now take the verb ‘iS’ – the suffix -S indicates ONE entity in focus and no signal on the verb such as ‘areØ’ indicates MORE THAN ONE entity in focus. The reason why the noun number usually matches the verb number is that it creates a local redunduncy that helps parse the items which crossed pairing (mismatches of noun number and verb number) do not create. That is the matched pairings apply to the same aspect of the message – the hearer is getting multliple semantic clues to approximately the same thing. Consider ‘the girls play‘ – this can be parsed and understood in isolation because the MORE THAN ONE of ‘girls‘ and the MORE THAN ONE of ‘playØ’ both indicate the number of ‘players’ and hence mutually support the parsing of girls as “subject noun” and play as “verb” (I am putting subject noun and verb in quotations to use familiar terms so as to avoid going into the terminology that Columbia Linguistics uses, see paper for more on this). Now consider that in crossed pairings each meaning applies to a different aspect of the message and so cannot help in identifying the other. So ‘the girls plays‘ is uninterpretable in isolation because there is no contextual support to help a hearer construct a message that would justify the ONE (entity in focus) of ‘plays‘ in light of the MORE THAN ONE (entity) of ‘girls‘. Thus, all things equal, more contextual support from elsewhere is needed to identify crossed number pairings than matched pairings. In “conventional warfare appear more dangerous” we can say the entity in focus with respect to appearing dangerous is a plurality which contrasts with the singular entity in focus with respect to being young (and not fully exploited and easily hidden from the public) in “the cyber warfare is young”. Now considered in this light perhaps the student’s use of such a contrast is worth praising rather than admonishing? Reid, W. (2011). The communicative function of English verb number. Natural Language & Linguistic Theory, 29(4), 1087-1146. The following borrows heavily from the original paper. Elena Gorokhova in 1995 reports on a developmental stage description of article use by Spanish L1 learners of English. She follows a description of final state article use that was formulated by William Diver – the founder of Columbia School linguistics which is a sign-based functional linguistics account. A sign is a pairing of a signal with its meaning. a) referent is unimportant to message as message is about an associated activity. Gorokhova then postulates 4 stages based on her longitudinal data which culminate in the Standard English state shown above. In stage V students acquire use of the Ø zero article. Here also “frame anaphora” is evoked by the use of the e.g. Someone is driving and there are people in the back seat. The speaker relies on shared non-linguistic knowledge (driving is usually done in a car which usually has seats) with the hearer. This stage is hard to acquire – of the seventy learners in Gorokhova’s study only two showed Stage V article usage. Although this study suggests a particular order of acquisition – The > A > Ø Zero article, there is no consensus in the literature. Some studies support this order, others show A > The > Ø Zero article, others show Ø Zero article > The > A. What is heavily implied though is that due to the discourse effects on article use, articles should not be taught in isolated sentences but with a piece of discourse in addition to background information about the speaker and hearer. I recently drew Figure 1 and Master’s figure of Classification vs Identification with a student. She preferred Master’s figure as she had trouble understanding the word differentiation. It should be noted in this case of focus on form and meaning there was only a cursory look in response to her question about using articles. Gorokhova, E. (1995). Acquisition of English articles by native speakers of Spanish. 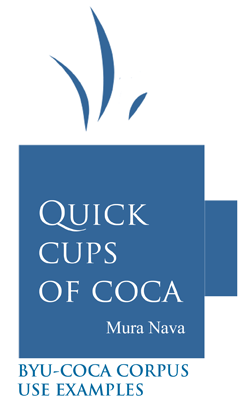 In Contini-Morava, E. & Goldberg, B. S. (Eds.) Meaning as explanation: Advances in linguistic sign theory, 441-452. Berlin: Mouton de Gruyter. In our example we can see that in 1 the student has correctly used “due to the lack of awareness of the victims” whilst in 2 we could argue that the student is implying the thought “with the lack of evidence (that they have)”. In marking feedback you might consider that since in sentence 1 the student has postmodified “the lack of awareness” with “of the victims” then we could give the student the benefit of the doubt in sentence 2 by saying they are implying a postmodification of “that they have” in the use of definite article in “the lack of evidence”. more than a quarter of the article “errors” were actually viable choices that should have been honored. He classed his data into noun phrase structure, modification structure and discourse structure. The noun phrase structures included count/noncount, generic/specific and idioms. The modification structures included pre-modifying ranking adjectives, postmodified/nonmodified, unlimited/limited quantity, partitive/descriptive Of-phrases, intentional vagueness. The discourse structure was first and subsequent mention. Master (2007) uses two reasons to justify this approach of looking at how students choose articles. One is that based on Yoon & Bailey (1988), as cited by Masters (2007), “teachers as editors often correct article usage in ways unintended by the original author”. And two based on Sheen (2007), as cited by Masters (2007), metacognitive feedback in addition to corrective feedback can impact student article use more than just corrective feedback. Furthermore teaching article use in context such as lexical bundles, which are another form of collocation, has shown to be effective (Shin & Kim 2017). It must be noted that the chances of finding what could be called a paired example (as in my student’s two sentences above) may be rare and so giving students more leeway could be harder to justify. Thanks for reading and if you want to explore more on article use have a read of some previous scribbles on this: Classified and Identified – A pedagogical grammar for article use and A, an, the, definiteness and specificity. Shin, Y. K., & Kim, Y. (2017). Using lexical bundles to teach articles to L2 English learners of different proficiencies. System, 69, 79-91. 1990 was a good year for music – Happy Mondays, Stone Roses, Primal Scream, James, House of Love. 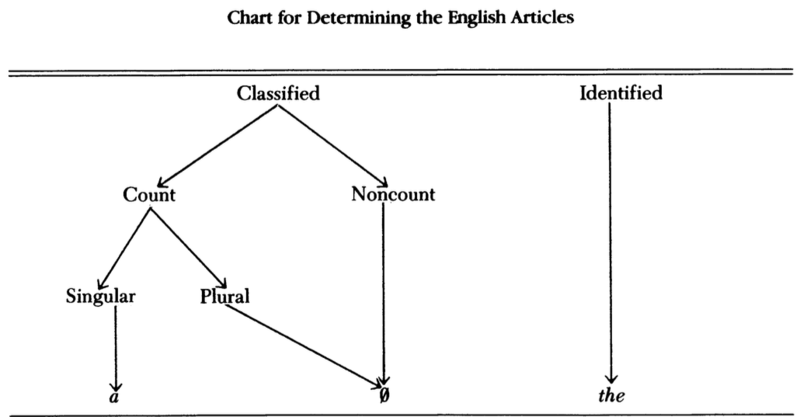 1990 was also good for what is, in my humble opinion, one of the best pedagogical grammars for article instruction – Peter Master’s paper Teaching the English Articles as a Binary System published in TESOL Quarterly. It is a pedagogical grammar because it simplifies the four main characteristics of articles definiteness[+/-definite], specificity[+/-specific], countability[+/-count] and number[+/-singular] into two bigger concepts namely classification and identification. So 0 or no article and a/an is used to classify and the used to identify. 1a. [-definite][+specific] A tick entered my ear. b. [-definite][-specific] A tick carries disease. c. [+definite][+specific] The computer is down today. Master’s binary scheme emphasizes 1b and 1c at the expense of 1a and 1d. That is +identification feature describes [+definite][+specific] and -identification or classification describes [-definite] [-specific]. The effect of ignoring specificity in indefinite uses is saying all uses of no article or a/an is essentially generic. Whether we mean a specific, actual tick as in 1a or a generic one as in 1b we still classify that tick when using the article a. Paraphrased as something that can be classified as a tick entered my ear/carries disease. Master goes on to give some advice for teaching classification. For instance, have students sort a pile of objects into categories – These are books/These are pencils/This is paper/This is a pen. For identification have students identify members in the categories – This is the blue book/These are the red pencils/This is the A4 paper/This is the new pen. In addition teach them that proper nouns, possessive determiners (my, her), possessive ’s (the girl’s), demonstratives (this, that) and some other determiners (e.g. either/neither,each, every) —> identify; while no article , a/an, and determiners such as some/any one —> classify. Countability only needs to be considered for classified nouns as identified nouns require the whether they be countable or not. I won’t repeat what Master says as I have already done too much of that. Once you read Master’s paper the two figures can be used as a memory aid. Master says that discourse effects of article use (e.g. given/theme and new/rheme) can be matched onto his binary schema i.e. given info is identification and new info is classification. And that for many noun phrase uses of article such as ranking adjectives, world shared knowledge, descriptive vs partitive of phrases, intentional vagueness, proper nouns and idiomatic phrases there is no need to go beyond the sentence unless first/subsequent mention is a involved. Master, P. (1990). Teaching the English articles as a binary system. Tesol Quarterly, 24(3), 461-478. Master, P. (2002). Information structure and English article pedagogy. System, 30(3), 331-348. This is a short post that sparked my curiosity about conditionals. Take it as you want. And if we were going to push for an election, then we should have made sure that we did something to determine who was going to win. First, I don’t think we should have pushed for an election in the Palestinian territories. I think that was a big mistake. If we were going to push for an election, we should have made sure we did something to determine who was going to win instead of signing off on an electoral system that advantaged Hamas. According to the Cambridge Grammar of the English Language, CGEL (Huddleston & Pullum, 2002) there are two kinds of conditionals – open and remote. Open refers to something that may or may not be the case, remote refers to something being unlikely or remote. Remote conditionals must have a modal auxiliary in the main clause (e.g. should) and a modal past form were in the if part. For the first Clinton quote we have these two features hence this is a remote conditional. If we look at the fuller quote we can argue that Clinton wanted to emphasize to this particular audience that the Bush administration at that time made a mistake. She uses the conditional to highlight this by imagining an alternative world where she was involved in making the decision. In this world she would have done something more than “signing off on an electoral system that advantaged Hamas” and “did something to determine who was going to win”. Now as to whether this means she would have rigged the election is up for anyone to speculate and whether that applies to election rigging in the US is similarly up for grabs. I’d be very interested to get your opinion, thanks for reading. Huddleston, R., & Pullum, G. K. (2002). The Cambridge grammar of the English Language. Cambridge: Cambridge University Press. This is my attempt at recombobulating my thoughts on article use. Information is mainly drawn from Ionin, Ko & Wexler (2004) and Thornbury (2009). All errors mine. The paper argues that English as a two article system (a/an, the) favours the definite-indefinite categorization hence the is definite and a indefinite and it does not mark any articles for specificity. Other languages like Samoan favour the specific-nonspecific categorization where they use le with specific and se with non-specific and does not mark any articles for definiteness. Side note: apparently in spoken English this can be used to specify nouns (i.e. referential use of this vs demonstrative use) hence we can consider also that English is a three-article system! The theory is that learners fluctuate between categorizing nouns on definiteness and categorizing nouns on specificity until they eventually settle on definiteness as their proficiency grows. Both systems of definiteness and specificity predict that learners will use one article the for definite specific and one article a for indefinite non-specific. However these systems differ on what article will be used with specific indefinites and non-specific definites. So what does this mean for teaching articles? Not sure but knowing that learners will tend to overuse the with indefinites and overuse a/an with definites due to the conflict with the specificity system is enlightening. Further I found the definitions in the paper very useful as I was confused about how specificity was different from definiteness. I’ll put here a revised table (Table 4) from Scott Thornbury’s blog on articles that does not have the confusing (for me) label general and colour coded for overuse as in Table 3 above. Finally for your students do check Glenys Hanson’s exercises and flowchart. Ionin, T., Ko, H., & Wexler, K. (2004). Article semantics in L2 acquisition: The role of specificity. Language Acquisition, 12(1), 3-69. Thornbury, S. (2009). A is for Articles (1) – An AZ of ELT – WordPress.com. Retrieved April 2, 2016, from https://scottthornbury.wordpress.com/2009/12/12/a-is-for-articles-1/.